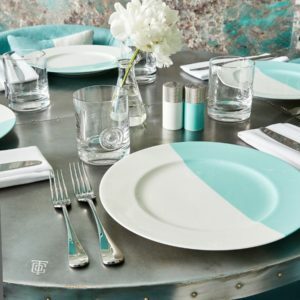 How to bring “Breakfast at Tiffany`s” home? 1st Pick a place – some nice room with comfortable chairs and enough space to make a buffet type of table. 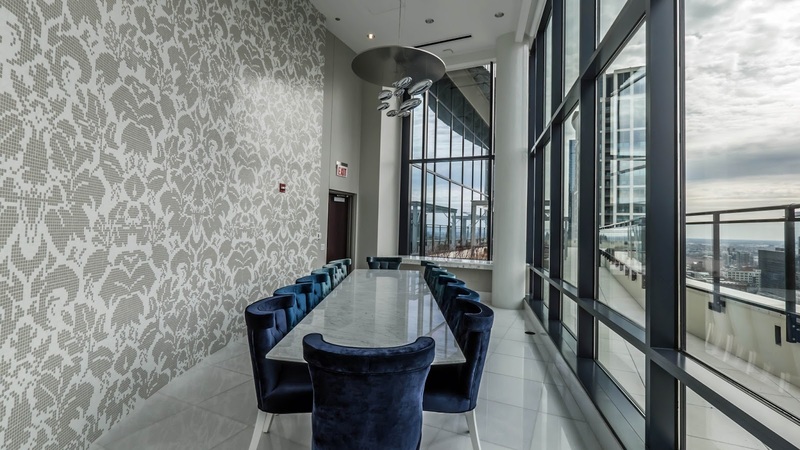 In my case, that was my friend`s party room at 73 E Lake in Chicago. 2nd Pick a time – I am born in December and one thing I love about that is that everyone is already celebrating so is not weird at all to have people drinking cocktails at 2 pm. Plus it gets dark so early and without proper lighting would not be as magical. Birthday party at 2 pm for adults! 4th Choose your menu carefully – you don’t have to overfeed your guests at 2 pm, but you still wont to serve something solid with the strong martinis and champagne. I choose to have croissant sandwiches with a variety of cheese dips. Also on the table: macaroons, mini chocolate mousse desserts, chocolate candies, olives, cheese tray, fig jam, gourmet crackers, etc. You can experiment with the menu and also make it fit your budget. 5th The one thing you don` want to save money on – The cake! If you make all that effort to have Tiffany`s party, you should have Tiffany`s inspired cake. Note: There aren`t very many great pictures on the web for a turquoise cake with pearls. I had to draw a little cheat sheet for the baker when I ordered mine, but It was worth it! 7th Glassware and silverware. I have decided I do not want to clean a lot after my party, so I just bought an imitation of silver spoons and forks. (I did not find what I wanted in Party City, but there are plenty of stores that offer a pack of cute plastic forks and knives) The one thing I did not want to compromise with was the martini glasses. Having a party outside your place is a little challenging, but I found a company that let me rent about 20 martini glasses and 20 wine glasses for cheap. I just had to pick them up (they come in pallets) and afterward to drop them off. You don`t have to wash them. Instagram lovers and Tiffany`s fans brace yourself! 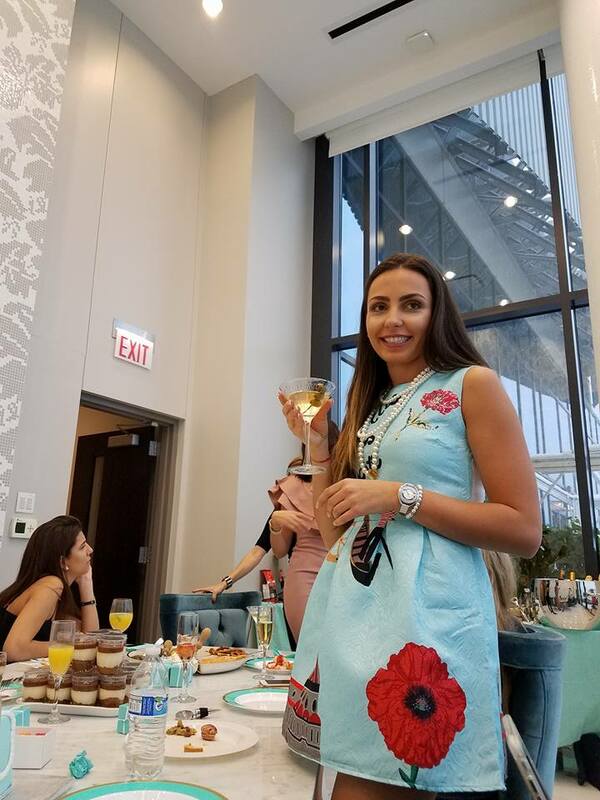 Now you c an really have Breakfast at Tiffany`s and not only that but lunch, brunch and afternoon tea. 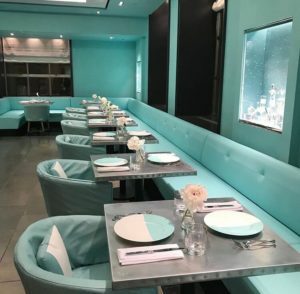 The multimillion company opened Blue Box Cafe on 10th of November at its flagship store in the heart of NY, and it`s fabulous. 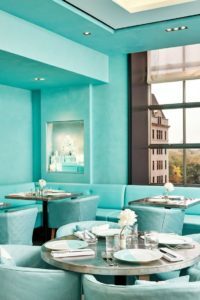 Located on the 4th floor, the entire Blue Box Cafe is furnished in Tiffany Blue. Display of high-class diamonds right next to the cute small tables adds to the chic atmosphere of the place. The sophisticated turquoise decoration can transcend you in the classic movie. Big windows that fill the room with light and create the perfect warm atmosphere. With that much of chic and cuteness, I’m sure the place will turn into the next hot spot for Instagram lovers visiting the Big Apple. (Bare in mind the last mentioned comes with a side of avocado toast or salmon bagel) Nothing too expensive for an exquisite view to Central Park. You can`t get this online, can you? For the real fans of Audrey Hepburn (like me), this place is like heaven. Blue Box Cafe is open during the store`s hours. Tiffany & Co. is located at 727 5th Ave, New York, NY 10022 and the cafe last seating during the week is 5:30 pm. All you need is little black dress and pearls.